36 x 28 ½ in. Highly regarded for his sumptuous still lifes, German-born Severin Roesen transformed the genre in this country when he emigrated in 1848. His lavish compositions juxtaposed with more austere works common in the early 19th century. 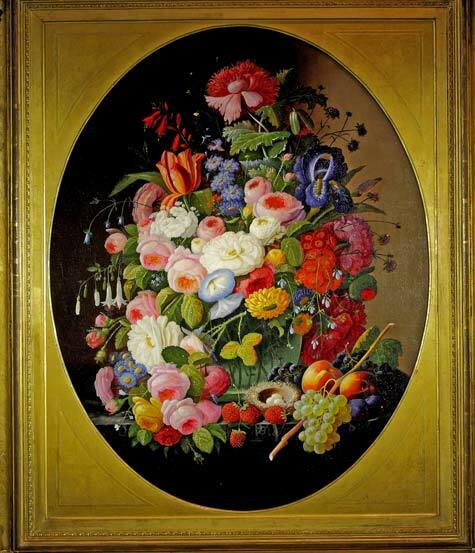 Inspired by 17th- and 18th-century Dutch compositions, Roesen’s bountiful combinations of fruits, flowers, and other objects like the glass bowl and bird’s nest seen here also speak to the perceived abundance of America’s natural resources and the prevailing idea that this country’s success was preordained by God. Although little definitive is known about his early life, it is likely that Roesen trained as a porcelain painter in Germany, as evidenced by his incredible attention to detail.